66. 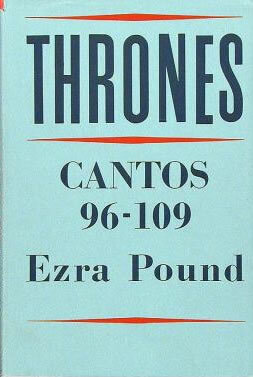 Thrones de los Cantares (Cantos XCVI-CIX). Milan: All’Insegna del Pesce d’Oro, 1959. Reprint, New York: New Directions, 1959. In addition to notes below, see 65. Reprinted in later editions of 57.
a. CVI. ‘At Miwo the moon’s axe is renewed’ (57, p. 775): Allusion to words spoken at the beginning of the tennin’s climactic dance at Miwo in Pound’s version of Hagoromo (13d): ‘The jewelled axe takes up the eternal renewing, the palace of the moon-god is being renewed with the jewelled axe, and this is always recurring’, lines that in a note in the play Pound equates with Dante’s ‘Quale nei plenilumii sereni / Trivia ride tra le ninfe eterne’, As in the clear skies at the full moon / Trivia (the goddess of the ‘three ways’—Diana) smiles among the eternal nymphs (the stars). Miyake (191) points out that the lines in the play and thus the image in the canto as well are based on ‘a curious mistake’ in the Fenollosa/Hirata draft of Hagoromo, since the intent of the original Japanese is that ‘the palace of the moon-god is so well made that it does not need [a] jewelled axe’.